In another episode of shooting your shot gone wrong, a lady’s version has left us in ironic tears when we saw the response she got from the gentleman she shot her cupid arrow at. Without beating around the bush, the lady gave it straight to the gentleman and asked him out on a date but this guy wasn’t gentlemanly enough as he went ballistic on the lady in response. 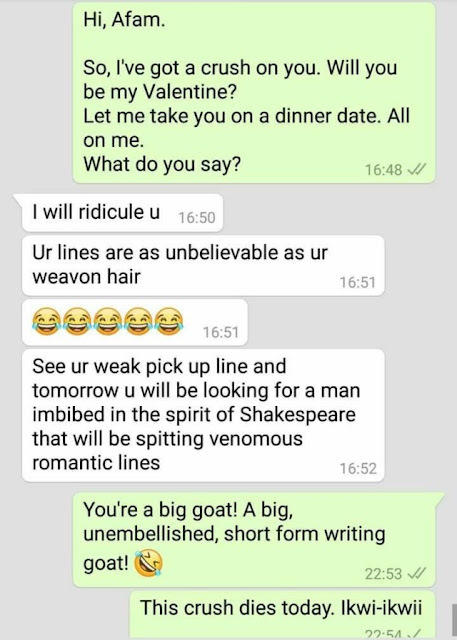 His response is just so hilarious that we have no choice than to share with y’all and to also let you ladies know that we guys too could do with a little shakespearean kinda romance.